Wed, 19 Jun at 6:00 PM - Fri, 21 Jun 2019 at 11:00 PM . 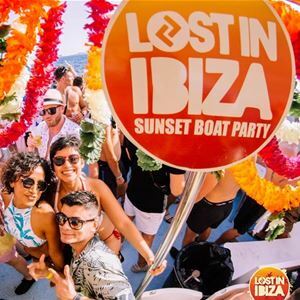 Lost In Paradise: Tckets include 3.5HR Lost In Ibiza Sunset Boat Party + 4 Free Drinks. Meeting Point Rio Bar San Antonio 4PM. Last Admittance 4:30PM. Boat Sails 6PM - 9:30PM. Includes before midnight entry to Jamie Jones Paradise Party DC10 + Free Bus from San Antonio to DC10 departing San Antonio Bus Station 11PM. Totally Lost tickets include 3.5HR Lost In Ibiza sunset boat party + 4 free drinks. Meeting Point for all customers Rio Bar, San Antonio. Doors open 4PM. Last Admittance 4:30PM. Includes before midnight club entry to Jamie Jones' Paradise Party @ DC10 + ABODE @ Amnesia + Cuckooland Pool Party Ibiza Rocks. Free bus San Antonio Bus Station to DC10 departs Weds 11PM.